Father Judge made their first appearance in the 42 year old tournament and left with the first place trophy. It took overtime, but The Crusaders (from the Philadelphia Catholic League) beat Hatboro-Horsham in a hard fought contest, 54-47. Norristown won the consolation game over Pottsgrove by a score of 62-37. 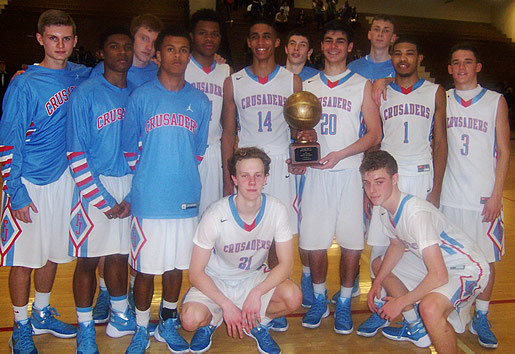 2015 Triangle Club Tournament Champions – Father Judge. Father Judge coach Sean Tait brought in a very good trio of guards who can shoot the ball. They are not a tall team but they run the floor and pass the ball very well. The Hatboro-Horsham Hatters are coached by Ed Enoch. Veteran Ed has always been a defense minded coach. They have some height and experience and are expected to contend for the Suburban One League Continental Conference title. Although, early into this season their top returning player, Brian McEachren, is still on the shelf with a leg injury. Coach Mike Evans and his Norristown Eagles return two top players from last year in Roy Green (6’4″) and Darryl Carr (6’5″). The Eagles carry 10 seniors on this years roster. Host team Norristown has won 21 of the previous tournament championships. The last being in 2012. The Pottsgrove Falcons played in their first Triangle Tournament. They came in with a 6-4 record under 10th year coach Scott Palladino. They are in transition rebuilding year after winning 19 games and finishing near the top of the PAC 10 conference last season. The 2015 opening night kicked off Monday December 28th and saw Father Judge top Pottsgrove 64-40. The game was tight 13-12 after the first period with Judge holding the edge. But by halftime Judge had tossed in 10 three point shots and led 35-18. The guard trio of Quincy Reed, Mark Rodriguez and Justin Fleming doing all the damage. Pottsgrove coach Scott Palladino tried 3 different defenses to try to stop the hot shooting Crusaders, but nothing worked. After 3 quarters the Falcons were behind 45-28. Justin Fleming, a (6’2″) senior guard led Judge with 15 points. Teammates Quincy Reed and Marc Rodriguez each added 14. Top scorer for Pottsgrove was (6’1″) senior Nazhir Golston who delivered 15 points on a tapped up ankle. Game two on opening night matched up two Suburban One League teams. Hatboro came on strong in the 4th quarter to defeat Norristown 55-42. The game was tight early on with Hatboro holding a 23-20 advantage at the half. Senior forward Tyrique Lyons (6’4″) had 7 first half points for the Eagles. Roy Green added some smoothe drives to hoop and scored 6 first half points. First half contributions from the Hatters came from lightning quick junior guard Jay Davis’ 10 points. High jumping (6’4″) Joseph Russell had 6 tallies. Hatboro clung to a 32-31 lead entering the final quarter. The game was up for grabs. But Norristown turnovers from the Hatboro tough defense proved costly for the Eagles. When Hatboro got to the free throw line down the stretch (making 11 of 14) it iced their victory. Big junior forward Clifton Moore (6’7″) made 6 out his 7 free throw attempts. He led the scoring with 14 points and many rebounds. Teammate Jay Davis also scored 14 points. Two other Hatters, Joseph Russell and Brandon Crews, rounded out the balanced scoring attack with 11 and 10 points respectively. Norristown’s scoring was paced by Roy Green, 15, and Darryl Carr, 13. The second night consolation game saw Norristown storm out of the gate and grab a first half 34-18 advantage over Pottsgrove. Guard Louie Gibbs tossed in 2 three pointers and (6’2″) sophomore Desmond Austin had 8 halftime points for the Falcons. Meanwhile, all 5 Eagle starters were hot. Carr, Green, Lyons, (6’3″) junior Darius McGowan and senior guard Amir Carter. The Eagles continued to dominate and increased their lead to 51-25 after 3 periods. The Potsgrove team could not buy a bucket as their shooting slump continued. Sophomore Austin was the only Falcon in double digits with 14 points. Norristown marched out of the gym with a well earned 62-37 victory. Two Eagles tossed in 14 points, Lyons and Carter. Darryl Carr added 13. The championship was set up with Father Judge battling Hatboro-Horsham. The final was intensely coached and hard fought. More than a few players grappled for rebounds and loose balls. Hard fought play ended with players diving on the hardwood. Coach Ed Enoch had his Hatter squad up 22-21 at the half. Sean Tait’s Crusaders were not going to back down. Judge was up 36-32 after 3 quarters. The guard trio of Fleming, Rodriguez and Reed again paving the way. Plus, a couple of three pointers from Matt O’Conner was giving the Crusaders a slight edge. But Hatboro was not to be denied. The Hatters outscored Judge 12-8 in the fourth period to tie it up 44-44 and send it into overtime. Big play from (6’7″) junior Clifton Moore was vital for Hatboro. Judge center Quinn DeNofa (6’2″) battled tough all night versus his taller opponent. The 4 minute overtime saw Judge canning 7 of 8 free throws and Hatboro not score a single field goal. After 36 minutes Judge was crowned the champion of the 42nd Triangle Tournament with a 54-47 victory. Quincy Reed earned MVP honors and tied teammate Marc Rodriquez with 13 points. Mike Power came up big with 11 tallies. Hatboro was led by Moore’s tournament high 20 points, including 3 baskets from beyond the arc. Triangle Club Pres. 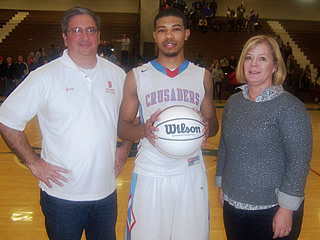 Barabara Hladik presents ball to 2015 MVP Quincy Reed of Father Judge. Thanks to everyone who helped make the Triangle Club’s 42nd Annual Holiday Basketball Tournament a success. Each year, through our tournament, the Triangle Club raises money to support our scholarship program. This would not be possible without the participation of these fine teams, as well as the support of our fans, the community, and our tournament sponsors. The Triangle Club thanks you all and looks forward to seeing you at next year’s tournament.